Ginkgo Biloba, also known as maidenhair tree, is an ancient tree which originated in a period over two hundred million years ago. Its home is in China, Japan and Korea. Here in Europe it appeared as late as in 1727 and since then it grows in parks and can reach the height of 25 meters. It is a deciduous tree and though it has leaves, we class it as the coniferous tree. The leaves of this tree are used for thousands of years in the traditional Chinese medicine. Today it is more and more applied in western medicine and is ranked among the most demanded herbal preparations. The leaf, which contains the effective ingredients as flavonoids, organic acids and phenolic agents, is picked. 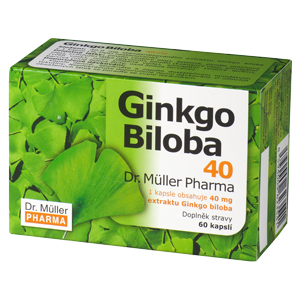 Each capsule contains 40 mg of standardized extract of Ginkgo biloba. Swallow 1 capsule daily and follow with sufficient amount of some drink. Do not exceed the recommended doses. The product does not substitute varied diet. The product is not intended for children. The product may reduce blood coagulability. Keep out of the sight and reach of children.